Paul D. Miller's Sound Unbound will be a "live" multi-media audio and visual presentation of the history of digital art and media from the viewpoint of an artist who remixes "found" audio and video using turntables and digital projectors. History itself will be the material for the mix, and the lecture presentation will focus on how dj culture has evolved out of the same technologies that are used for digital media and art. In the second half of the presentation, Paul will be joined by the new media art collective 47 for a panel on reconstructing media and digital graffiti. The panel will explore strategies for increasing media literacy and responses to a world increasing saturated by imagery and dominated by corporate propaganda. Paul D. Miller (a.k.a. DJ Spooky) is a conceptual artist, writer, and musician working in NYC. His written work has appeared in The Village Voice, The Source, Artforum, Raygun, Rap Pages, Paper Magazine, and a host of other periodicals. He is a co-Publisher, along with the legendary African American downtown poet Steve Canon, of the magazine A Gathering of the Tribes - a periodical dedicated to new works by writers from a multi-cultural context. He was also the first Editor-At-Large of the cutting edge digital media magazine "Artbyte: The Magazine of Digital Culture." Miller's work as an artist has appeared in a wide variety of contexts such as the Whitney Biennial, The Venice Biennial for Architecture (year 2000), the prestigious Ludwig Museum in Cologne, Germany, Kunsthalle, Vienna, The Andy Warhol Museum in Pittsburgh and a host of other museums and galleries. As a lecturer, Miller has given presentations at Harvard Law School, Princeton, the Museum of Contemporary Art (L.A.), Columbia University School of Architecture, and MIDEM. He is a faculty member at the European Graduate School. But even with all this, Miller is most well known under the moniker of his "constructed persona" as Dj Spooky that Subliminal Kid" a character from his forthcoming novel Flow My Blood the Dj Said, that uses a wide variety of digitally created music as a form of post-modern sculpture. Miller has recorded a huge volume of music as "Dj Spooky That Subliminal Kid" and has collaborated a wide variety of pre-eminent musicians and composers such as Iannis Xenakis, Ryuichi Sakamoto, Butch Morris, Kool Keith a.k.a. Doctor Octagon, Killa Priest from Wu-Tang Clan, Yoko Ono, and Thurston Moore from Sonic Youth. His two latest releases Under the Influence and Modern Mantra are dj mix records that include tracks from a diverse array of artists including Moby, Future Sound of London, Ryuichi Sakamoto, Talvin Singh, Saul Williams, Anti-Pop Consortium, DJ Krush, Aesop Rock, Jack Dangers, and others. 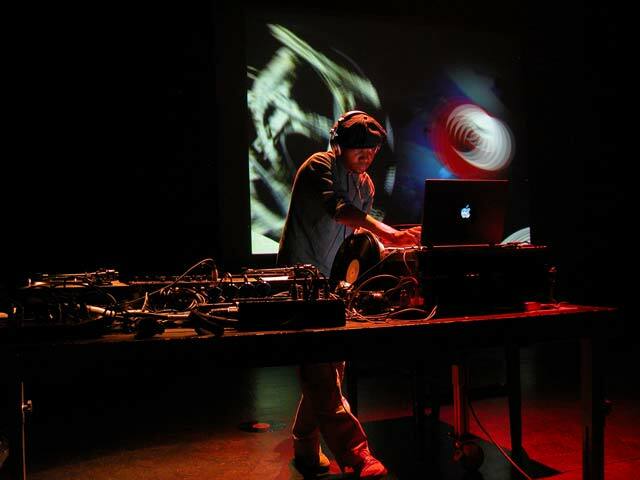 In his live performances DJ Spooky weaves a unique sonic texture using vinyl records, CDs, electronic effects, an amplified kalimba and an upright electric bass, all while mixing video footage live from his laptop computer. Miller's most recent projects include the "Unfinished Stories" - a three way collaborative effort between Pulitzer Prize winning NY Times Critic At Large, Margo Jefferson, and Francesca Harper and a collaboration with Bernard Tschumi, Dean of Columbia University's Architecture Department, and author of Praxis: Event Cities. This piece debuted at the Venice Bienniale of Architecture 2000.